In the morning of Mar. 8, 2013, the delegation led by Chairman Lin Zhicheng of Boai Medical Investment Group and General Director Lin Junxiong of Modern Cancer Hospital Guangzhou met the press in Swiss Hotel. The Thai media gave the delegation a warm welcome, and Chairman Lin talked to the media about concepts of Boai and introduced the technologies and service of Modern Cancer Hospital Guangzhou. Chairman Lin extended welcome to the Thai media present and introduced Boai Medical Investment Group. Established in 1989, Boai Medical Investment Group, covering 14 regions globally and having more than 100 large medical institutions, is one of the global top100 medical investment groups. To be the largest medical enterprise group and offer the most satisfied medical service is the conception of Boai Medical Investment Group, and actually Boai has all the way reflected its actions to this goal. The subsidiary hospital of Boai, Modern Cancer Hospital Guangzhou has completely complemented the conception of offering the best medical service. Modern Cancer Hospital Guangzhou gathers medical talents from home and abroad, introduces the leading technologies and devices to provide patients various characterized medical services. In addition, hospital also positively has academic exchanges with the World Health Organization (WHO), scientific research institutions and institution of higher learning. Through constant conclusion on tumor treatment, Modern Cancer Hospital Guangzhou combines minimally invasive technology of western medicine and treatment technology of traditional Chinese medicine to create the treatment mode of minimally invasive and targeted treatment integrating western medicine with traditional Chinese medicine. The clinical application of this treatment mode wins praises from patients and their families and the high appreciation on achievement and development of cancer treatment from the Director-general Cary Adam of Union for International Cancer Control (UICC). Modern Cancer Hospital Guangzhou has respectively set up 8 branch offices in Vietnam, Thailand, Cambodia, Indonesia, the Philippines, Bangladesh and countries so as to serve more cancer patients. In those offices, the overseas cancer patients can have free professional consultation service and get to know about the hospital ahead, through which the offices gain a good reputation from patients. Chairman Lin said, minimally invasive and targeted treatment integrated with traditional Chinese medicine and western medicine is a new treatment mode that locally and directionally kills tumor without hurting normal tissues or organs around. Compared to general treatment, it also avoids overtreatment and destroying the physical immunity of patients to reduce the pain patients may suffer, extend their lives and improve living quality and long-term treatment effect. What is more, patients undergoing treatment in Modern Cancer Hospital Guangzhou can not only have the advanced cancer treatment technology like radioactive particle implantation, cryotherapy, interventional therapy and so on in the world, but also enjoy more than 60 increment services and the local tour of Guangzhou, etc at the same time. 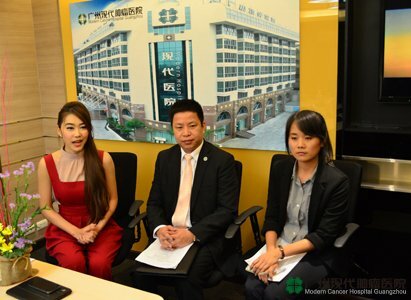 On Dec. 28, 2012, Modern Cancer Hospital Guangzhou set up a branch office in Thailand to offer local patients and family members free consultation services. The Bankok office has regularly held health seminars with the hope to strengthen the anticancer awareness of local people and introduce the advanced cancer treatments to Thailand so as to save more patients and their family who have been suffering a lot. On Jan. 3, 2013, the chief tumor specialist of Modern Cancer Hospital Guangzhou Professor Peng Xiaochi was invited by Bangkok Office to give a health seminar of non-operation tumor treatment in the Emerald Hotel. This seminar won the approval and praise of Thai people by elaborating the latest cancer treatment mode and principles, and replying to questions like how to combine treatment with medical care to improve treatment effects. Bangkok Office also provides patients and their family the serves like visa application, medical care, airport delivery and pickup, regular follow-up, suggestions on cancer care and diets, by which have promoted the Sino-Thailand cancer treatments and extension of advanced treatment technologies, and contributed to increase the confidence of patients in fighting cancer. When the media asked whether it is helpless even the cancer patients in mid or late stages take treatments, Chairman Lin replied that this mind is wrong and there is hope, though the patients in mid or late stages would be tougher and more complicated. The treatments for those patients should base on the goal to improve their living quality and extend their life. However, of great harm to patient body, conventional chemotherapy and radiotherapy are inapplicable to the ones in mid or late stages. Modern Cancer Hospital Guangzhou uses the comprehensive treatment of standardization, individualization, humanization and minimal invasion for the different symptoms patients are suffering from. Through the treatment mode of minimally invasive and targeted treatment integrating traditional Chinese medicine with western medicine, those mid or late-stage patients can be under effectively control to effectively improve living quality, extend life span and even survive with tumor. Chairman Lin also emphasized that early prevention and treatment of cancer is important. For instance, female regularly have cervical screening and take the injection of cervical cancer vaccine early can highly cut down the incidence of cervical cancer. Also, breast cancer patients, if diagnosed early, through interventional therapy, radioactive particle implantation and cryotherapy and other treatments in Modern Cancer Hospital Guangzhou, can reach the therapeutic effect of clinical cure. The present media said welcome Boai Medical Investment Group to set up hospital in Thailand so as to serve more cancer patients and benefit local people. Chairman thanked the Thai media for their attention and support, and Boai Medical Investment Group and Modern Cancer Hospital Guangzhou will endeavor to serve the Thai cancer patients. After the press, Chairman Lin received the special interview fromRoyal Thai Army Radio and Television Channel 5. Journalist: What are the risk factors for people to develop cancer? Chairman Lin: As society develops, the pollution caused from industrialization in air, river water and food gets worse. And the living and dietary habits of people, for example, staying up late, smoking and unhealthy diets and so on, can be the risk factors of cancer. Journalist: Then how Modern Cancer Hospital Guangzhou treats these tough diseases? Chairman Lin: Modern Cancer Hospital Guangzhou has created a brand new treatment mode: minimally invasive and targeted treatment integrated with traditional Chinese and western medicine, which has broken the conventional treatment methods, and of whom the feature is to combine the minimally invasive treatments like radioactive particle implantation, cryotherapy, interventional therapy and natural therapy with the historical Chinese medicine of thousand years. It avoids the shortages of single treatment and acquires marvelous treatment effect clinically. 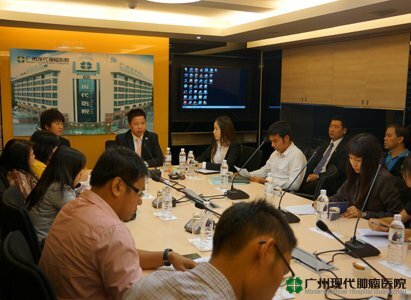 As the interview went on, the journalists of Royal Thai Army Radio and Television Channel 5 was surprised about the advanced technologies and quality medical services Modern Cancer Hospital Guangzhou offers. They hoped that Thailand and China, based on friendship and mutual assistance, can have more exchanges on cancer treatments to fight cancer together. Chairman Lin replied, that is also the goal Boai Medical Investment Group and Modern Cancer Hospital Guangzhou has all the way strived for.